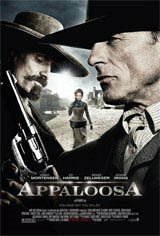 Set in 1882 in the Old West territory of New Mexico, Appaloosa revolves around city marshal Virgil Cole (Ed Harris) and his deputy and partner Everett Hitch (Viggo Mortensen), who have made their reputation as peacekeepers in the lawless towns springing up in the untamed land. In the small mining community of Appaloosa, a ruthless, powerful rancher named Randall Bragg (Jeremy Irons) has allowed his band of outlaws to run roughshod over the town. After the cold-blooded murder of Appaloosa's city marshal, Cole and Hitch are hired to bring the murderer to justice. While establishing new authority with equal parts grit and guns, Cole and Hitch meet provocative newcomer Allison French (Renée Zellweger), whose unconventional ways threaten to undermine their progress and to destroy the two lawmen's decade-old partnership.